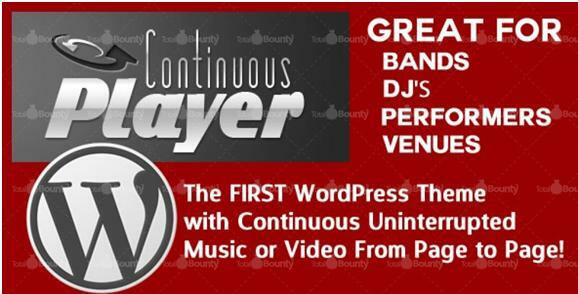 Continuous Player Theme is a WordPress audio video theme designed for bands, music, DJs, clubs, lounges, web designers and musicians. The theme gives better experience because it gives uninterrupted audio video music from page to page continuously removing the headache of starting or stopping buttons. WordPress 3.0 and up are required. Added facility for ad management. Integrated image uploader facility is available. Widget friendly footer is provided. Option is available for Aloha panel themes. 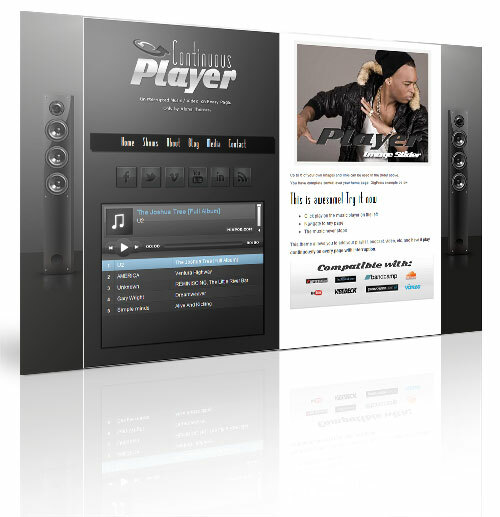 Continuous audio and video playing options are included for integrated audio or video. Photoshop PSD files are integrated for background and logo. Addition of contents on home page is very easy just as addition of widgets. Logo can be easily added ion Aloha panel. Works with GigaPress and helps in managing band performance schedules. Theme options make it easy to change the company logo, background image and color left or right to it and text and menu colors. Well thought out options make changes easily and quickly. It is very easy to use administrative features. Well support base from the author of themes directly. Very easy to understand documentation. Photoshop PSD files are completely editable. The theme quickly customizes with PSD file. Theme is social media friendly. User can link with social media site of his preference. It supports a very good variety of music and video services making the theme more acceptable. An expert can be hired from the site to install the theme and customize the web site. There appears to be no important disadvantage with the theme. Minor operating problems can be easily sorted out with the help of supportive help. The theme costs just $77 only. A guaranteed return policy is provided by alohathemes.com if the theme does not impress the purchaser.